Iowa State marching band performing at a football game. 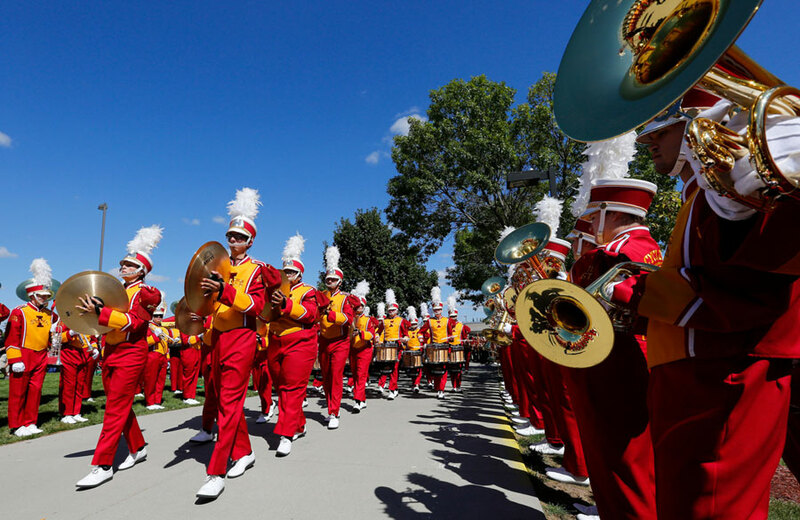 Iowa State University’s Marching Band has won a prestigious award. The 80-pound trophy was made by the same artist who designed the Heisman Trophy. 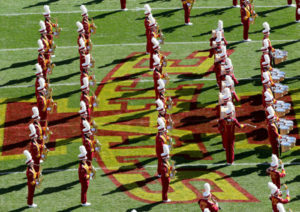 The official name for the group is the Iowa State University Cyclone Football “Varsity” Marching Band. The band was secretly nominated for the Sudler Trophy by someone outside ISU. The trophy is awarded every two years by the John Philip Sousa Foundation. “John Philip Sousa is the father of the march,” says Steven Smyth, the director of Iowa State’s marching band since 2011. Smyth was also a member of the band when he was an ISU student. The Sudler Trophy recognizes programs that “have made outstanding contributions to the American way of life.” Bands at Notre Dame, Nebraska and, back in 1990, the University of Iowa have been among the 31 programs that have been recognized. 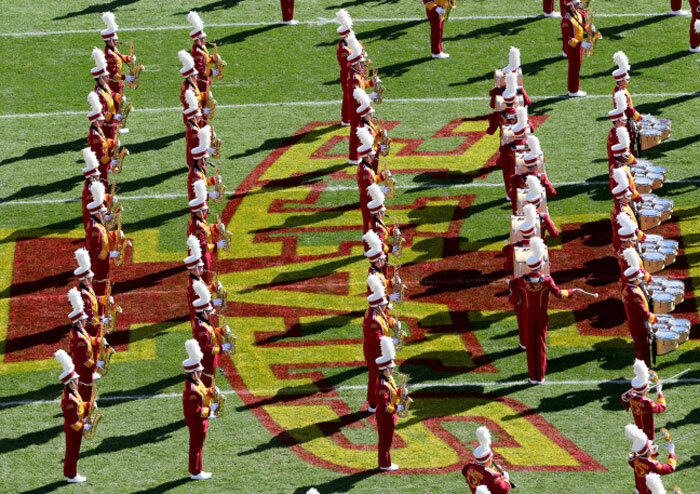 Iowa State’s 2016 “varsity” marching squad has 364 members, the vast majority of whom are not music majors. During a regular football season, band members memorize about 20 pieces of music for half-time shows and up to 200 different “sets” or drills for their on-the-field performances. During the games, the band occupies the space behind the field’s north end zone and plays a variety of tunes to rev up the crowd. “Probably it’s more important what we do during the game than what we do at halftime,” Smyth says. However, the band’s director suspects the organization was selected as the newest Sudler Trophy winner because of its “outreach” beyond game days, things like summer camps and visits to Iowa high schools. “It’s basically the only trophy/award/anything that college marching bands get,” Smyth says. The trophy will formally be awarded to the band during a home game in Ames next fall. The 80-pound piece of hardware will stay on the ISU campus for two years, then travel to the next Sudler Trophy winner in 2019. The first Cyclone Marching Band was formed in 1881. According to band lore, there’s a reason “varsity” was inserted in the name and the group calls itself the ISUCFVMB. The band cleaned the football stadium in the 1970s to earn money. Earle Bruce was ISU’s football coach at the time. Bruce encountered some marching band members in the football team’s locker room, changing clothes. The coach announced the locker room was for the varsity football team only. Photos courtesy of Iowa State University.